Get the peace of mind that comes with knowing the vehicles you bid on are already retail-ready. 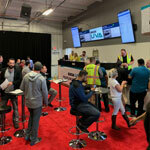 Hundreds of dealers rely on ADESA UVA auctions every week for their trusted service and reliable inventory. Our goal is to help car dealers meet the challenges of today’s marketplace by providing the opportunity to buy and sell inventory in a comfortable, convenient and exclusive environment. This is ADESA UVA. At ADESA UVA auctions, vehicles are booked in advance and fully reconditioned with a clean Carfax. Purchase inventory from UVA—either online or at one of our catered auction events. Arrange your own transportation or have us do it for you. Send a check to the facilitating auction, and we’ll send you the title. Inspect vehicle upon arrival and email us within three business days if it doesn’t meet your expectations. Fax or email booksheets to UVA, along with your reserve prices, pictures and relevant disclosures. Attend the sale online or in person to represent your vehicle and approve the sale. Make a vehicle available for transportation once it sells. Send the title to the facilitating auction. Once it’s inspected by the buyer, we will send you a check in no less than three business days from delivery. 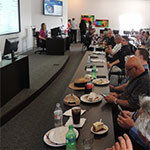 Register today and find out how hundreds of dealers benefit from UVA every week. Licensed dealers can register with ADESA UVA to access run lists, see condition reports, search inventory and buy online. All UVA members are invited to any of the following physical auction locations. To attend the auction online, please log in above. NOTE: Checks and titles are sent to the facilitating auction listed for each sale, which is not the same as the address listed for the physical sale in every case. Consign your vehicles with a reserve price that makes sense today. Your cost may not be the market price. You are responsible for the accurate representation of your vehicles. Have quality pictures of your vehicles. Submit your booksheets as early as possible and no later than 6 p.m. the day prior to the sale. Early submittals allow us to advertise the upcoming consignment and attract more buyers. Have sold vehicles ready for immediate delivery. Once a vehicle is sold at our event, it’s sold. A sale fee will be assessed for vehicles sold and not available for pickup. ADESA UVA issues a sales disposition for each vehicle sold. Copies are emailed to both the buyer and seller. All vehicles offered for sale are retail-ready unless otherwise disclosed. Normal wear and tear is expected. Minor paintwork is acceptable if done to industry standards. Anything that affects the retail sale of that vehicle needs to be disclosed. Manufacturer stop-sale vehicles will not be offered; all other recalls are sold on a "buyer beware" basis. The local UVA sites work with buyers on arranging transportation. Transportation fees are separate and charged based on distance. For any car sold through UVA that isn’t available for pickup—whether it’s retailed or out of stock—the seller is charged a $275 sale fee. The fee will then be remitted to the buyer, who otherwise would have received the car. Buyers have three business days after delivery to inspect and accept the vehicle or request arbitration. Arbitration window is closed 10 business days from sale date regardless of transportation. On accepted vehicles, the seller will send a clear title and smog certificate (if applicable), and the buyer will send payment to the facilitating auction location. The facilitating auction address can be found at the bottom left of the sale disposition. 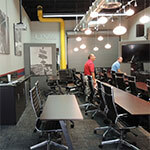 UVA is proud to offer inventory financing through most new-car dealer captives and all the major floorplan providers. Given that UVA sells reconditioned vehicles, your flooring dollar goes further than it would in the physical auction lanes (pre-recon). Just let us know if you have any questions. An adjustment may be made to the final sales price. The vehicle is inspected by an employee or authorized representative of UVA, if needed. The sale may be rescinded and the seller will be responsible for all transportation costs. There is a $350 mechanical arbitration deductible (first $350 of any mechanical repairs are paid by the buyer). UVA will notify the buyer and seller of the final outcome by email. If an adjustment has been made, a new sales disposition will be sent. Arbitration will not last longer than 48 hours unless agreed upon by both parties. 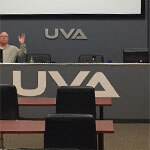 By participating in a UVA event—either as a buyer or seller—all parties agree that UVA is the final arbiter and its decisions are considered final and binding. 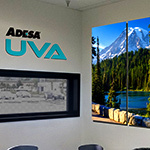 Contact us at UVA.ADESA@adesa.com if you have additional questions about ADESA UVA.